I like to build products at the cross section of art and technology. I have a soft spot for street art and graffiti. Public Art is a project to preserve street art online for the future; making it searchable and citable. Software as a Service for Medium writers to provide their readers a email reminder. Developed around the OEmbed W3C API and integrated through Embed.ly. I write on Medium and cross-post to my blog. Publications are taking email newsletters promotion seriously, with prominent signup placements on every page. Yet, are we using it correctly? I always knew that there was a huge difference in reading the news in print and online. Print content is contextually laid out. Digital content is consumed in isolation. How could a simple app that processes camera data for audience reactions change the feedback received when speaking publically? The week before Thanksgiving, I was on the subway home from Brooklyn and editing the promo video for the app on Photoshop. Anything that can help accelerate the process is helpful. I’ve worked at media companies for over three years. Watching the recent discussions about ad-blockers, advertiser’s impinging on reader’s rights, and the growth of content distribution networks (read: Facebook, Apple News, RSS readers), I want to share how it feels to be a web developer. Twitter meets Github and Exposure. A platform for software engineers and creatives to actively show proof-of-work on side-projects. Research tool for monitoring and analyzing email newsletters. Developer a email analysis pipeline for extracting links and content. Subscribed to 150+ email lists and monitored trends for 2 years. Made in response to the UX of photo carousels. Sweetspot provided a different way for photojournalists to layout their pictures in narative form. Creators pick "sweet spots" on pictures, that link to another gallery phot. A web app that allows you to listen to and share breakup stories. Hundreds of people have called in their 15-45 second breakup stories that are shared across the site. Google Chrome extension that creates a D3.js "connected particles" animation for every new tab. Twitter based match making service to encourage online friends to meet in person. Lunnch was based around an interface that allowed users to opt-in with their availability, and match with other creatives for lunch (or breakfast). E-DNA stands for Editorial DNA. This was a new-tab dashboard for providing magazine web producer's daily workflow. Based on the time of day, common tasks were surfaced. Web traffic on a designated website was analyzed through Google Analytics and compared against Google trends throughout the day. Display a beautifully animated series of panels with Google Trend tabs. Tool for synthesis email responses for email newsletter managers. ReplyFrom provided a unique email to use as the "reply to" address and an easy-to-use UI for managing and aggregating responses. Built a Twitter bot that posted graffiti and street art images from various public sources. The account developed a following of 8500+. At its peak, @streetartfound was getting over 800,000 impressions a week. Built as a "data donation" platform. City Mission allowed organizations to run a campaign around a "data" problem. The campaign composed of collecting participants, then once the participant requirement was hit, instructions were sent out to facilitiate data collection. Platform for graffiti art geneology. PAF tried to create a digital representation for every piece of graffiti/street art. The platform to track artists, works of art, and high traffic graffiti spots. URL shortener that uses words instead of string hashes. So you can say, "go to stinkybad.com slash lion". Simple website that explains the Soka Education pedagogy. Newsletter for developers to share sideprojects. Got 200 subscribes over a weekend and validated interest. Manually polling audience for projects was inefficient and project died. Browser extension that ran "meta" searches against keywords in your active tab window for news websites. The searches checked Facebook social-graph data against the names of locations or people. Game for presenting pictures and asking users for input. The pictures are scraped graffiti images. The user is asked to input the artist's name. Data is stored and compared against past results to identifer user consensus. If there is consensus, then the images is correctly tagged and both users get a point. If there is no majority consensus, the users lose a point. 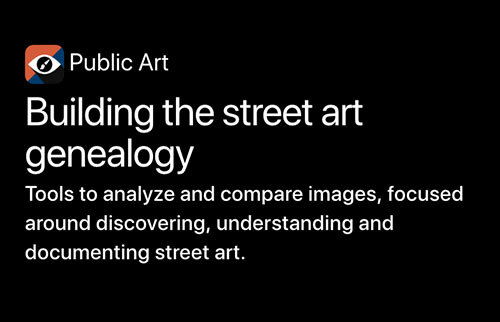 Public Art was an iOS application that made it possible to discover over 100,000 new street art and graffiti images from Instagram, a month. The project started after I had created a photo pipeline from Instagram, where I indexed all images with lat/lon data and a series of hashtags. Based on this "feature", I realized there was no effective way to browse the images. The result was an app that passed the device's own current location, and processed a search query for the nearest indexed images. The project ran for 2 years until the "features" used to pull Instagram images couldn't confidently return graffiti and street art. The cost of processing every indexed image to prevent undesired images was too much at the time. Events for changing scrolling behavior with a requestAnimationFrame debounce. WordPress plugin to implement Remind to Read. Allows blog administrators to add multiple users to blogs at a time. Blog administrator can specify email/username, firstname, and lastname. The display name of an account is set to "Firstname Lastname". This repository is a Yeoman webapp installation with properlly configured Foundation. Download andget started! My most updated professional work history can be found on LinkedIn. I have worked with the companies below, as well as many others that are not listed.